Their friendship was not just unlikely – it was in many ways unwelcome. If you were to list out every detail about them, you would have to place the word “different” in front of it: different homes, different genders, different traditions, different schools, different ethnicities, and the list continues. Such is the case with millions of youth around the world living near contentious borders that divide sometimes hostile national neighbours and create a cohabiting cultural clash. Communities like that of the small town of Isfana, Kyrgyzstan are perfect examples of these issues. Despite the fact that it is bordered on three sides by Tajikistan, Isfana faces more deep-seated challenges between Kyrgyz and Uzbek cultures. Many of these challenges date back decades to the post-perestroika deterioration of the former Soviet Union’s socio-economic status, which left much of the border between the two countries under dispute through the 1990s. More than just a nationalistic pursuit, the agreement upon the exact location of the border would determine the allocation of scant but vital natural resources like water and agriculturally useful land. These overarching disagreements have led to cultural clashes, sometimes resulting in violence and even death. This flame of the dispute was further fanned by Uzbekistan in 1999, when it unilaterally erected a barrier along an unofficial border, following the Tashkent Bombings that took place earlier in the same year. As a result of the Soviet Union’s collapse, the ambiguous border’s dispute, and this barrier’s construction, a large Uzbek population now resides in Kyrgyz territory, only furthering the spread of inter-ethnic conflict between the now cohabiting groups. Needless to say, the relationships between the two countries and their people, on both governmental and personal levels, have been tense for quite some time. That is what makes Begimay and Yashko so remarkable. Begimay speaking at a GFP programme in Isfana, with Yashko sitting by her side. The only thing the two students appear to have in common at surface level is their age. Both 17 and in year 11 of school, Begimay and Yashko have defied all odds and formed a close friendship that crosses cultures, defies expectation, and destroys barriers. And they did so through simple activities in arts and sports. Situated on opposite ends of the small town of Isfana, Begimay’s secondary school is the smallest in the area, while Yashko’s is one of the largest. Her education is conducted in Kyrgyz and Uzbek; his, in only the latter. Although she may have interacted on occasion with Uzbek students in her younger years, Begimay’s school only allows the attendance of Uzbek children through year four. Thanks to this policy, many of those memories have faded. The division between the two groups is not just prominent through governmental action and educational opportunities: it reaches a familial level, as well. “My family and my near relatives wanted me to be friends with Kyrgyz children,” Begimay explains, “but I know that is incorrect in my mind.” The youngest of two, Begimay listened as her parents encouraged her to create and maintain friendships with Krygyz children instead of with Uzbeks, admitting that she knows they only want what they think is best for her. Begimay’s older brother seemed more interested in following their advice, socialising only with people sharing his own ethnicity. This was an admittedly simple task considering the little or no overlap in the academic and social lives of most Kyrgyz and Uzbeks. The lack of positive interaction between the two cultures has led to recurring cycles of political and personal violence, which only serve to encourage a more clear-cut division between the two groups. Begimay and Yashko are just two of the many youth in Kyrgyzstan’s Batken region affected by this tension and subject to its influence. 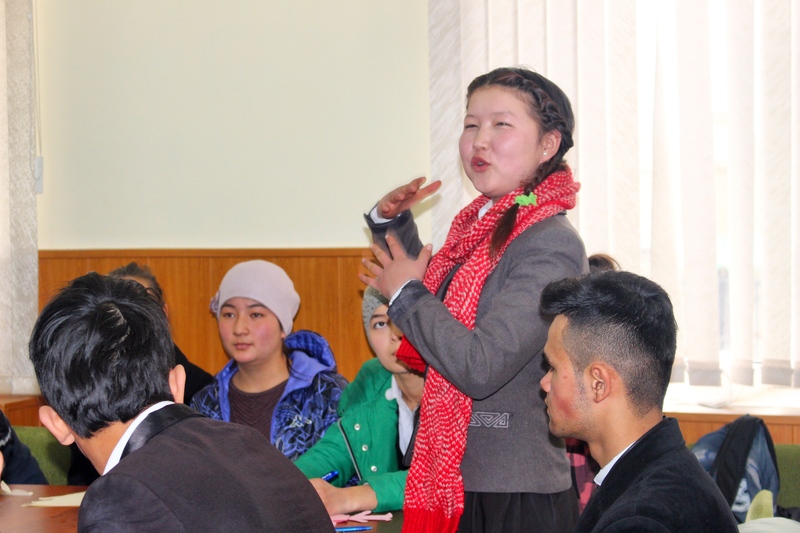 In 2014, however, a way for youth from both Uzbek and Kyrgyz backgrounds to come together in attempt to diminish strained relations was implemented in Isfana, creating a bridge between the two communities living side by side in the small town. It was here that Begimay met Yashko. 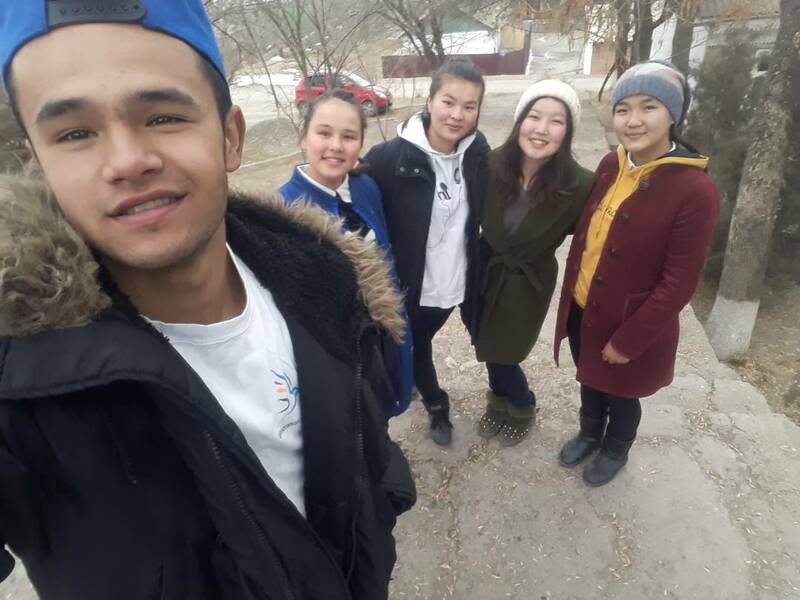 Yashko (front left) and Begimay (second from the right, back) take a selfie with some friends at a GFP programme in Isfana. 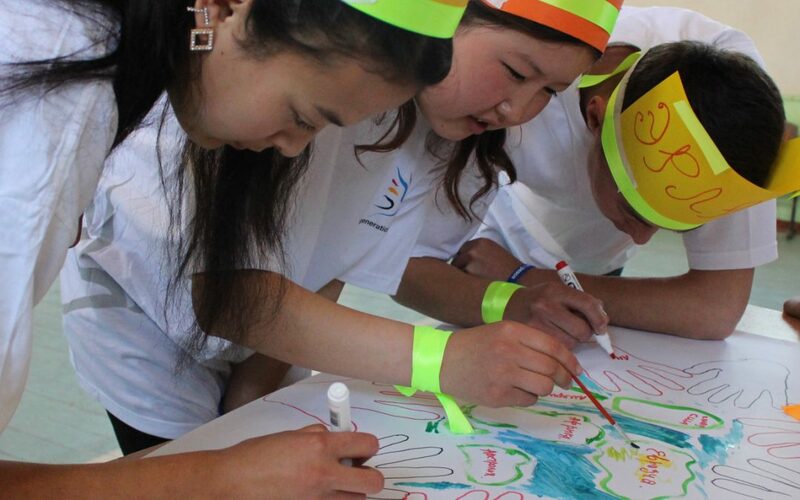 Generations For Peace (GFP) first implemented youth-focused peace-building programmes in Kyrgyzstan in the 2014-2015 academic year. 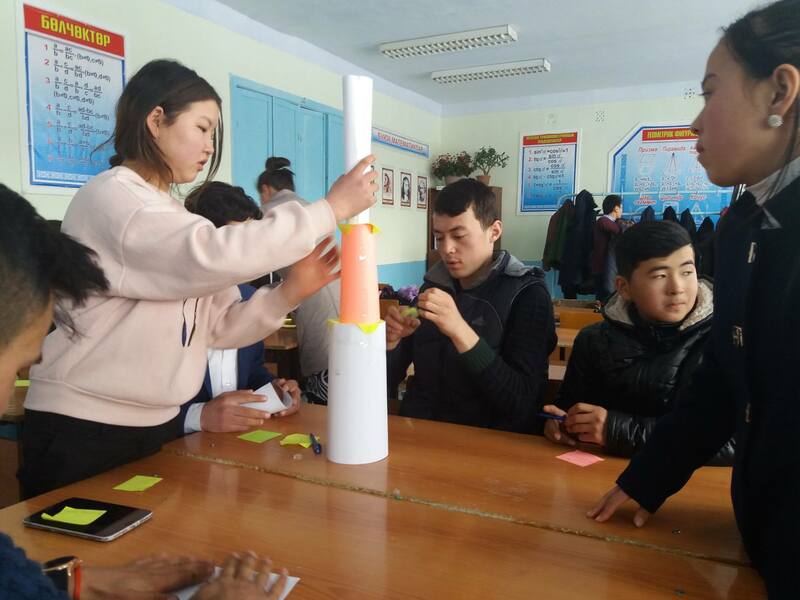 Begimay and Yashko were among the first to attend, joining in on the initiatives to bridge the gaps between students attending Uzbek and Kyrgyz schools using sport and arts for peace activities. “In the week, we spent our time with GFP and learned about tolerance and how become leaders,” she shared, explaining that she loves art and is excited about how she can use it to become a leader in her community. Begimay and other children from Isfana creating arts projects with GFP’s programme. Since these programmes were first implemented, six schools in Isfana with students of varying Uzbek and Kygyz backgrounds have taken part in the activities, providing the children with an opportunity they do not get in the classroom or at home: the ability to interact with, learn from, and form relationships with youth that do not share their own ethnic backgrounds. These programmes are not the only source of progress in the region. In the past few years, there have been glimmers of hope in diplomatic relations between Kygyzstan and Uzbekistan, with Kyrgyz President Sooronbay Jeenbekov ratifying border confidence-building measures in early January 2018. These represent a newfound collaboration and cooperation between the governments of the two countries. However, while there are signs that point toward optimistic outlooks at a political level, these have yet to trickle down. In fact, in late January of 2018, violence continues to plague the disputed border and has resulted in the reported shooting of a Kyrgyzstani man on the Uzbek-Kyrgyz border. These issues are not unknown by the dozens of students engaged in Generations For Peace programming. Yet friendships continue to deepen, understanding continues to expand, and acceptance continues to solidify on the campuses scattered across the town of Isfana where Begimay and Yashko first became friends.